We made it! Fantastic journey then welcome parade and party when we rode down Beach Street in Green Harbor, Marshfield MA on August 25th. Happy Birthday Olivia! I’ll add more details later but Kurt Schlosser at Geekwire wrote a great summary here. 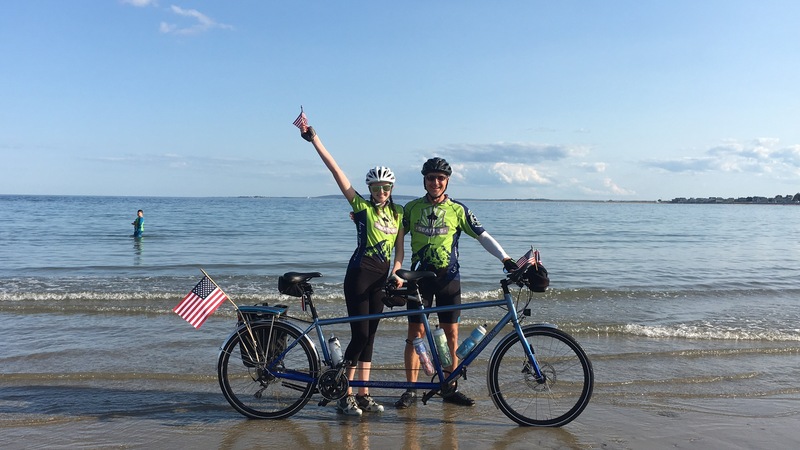 Thank you everyone for your generous contributions and support as we rode this epic journey. 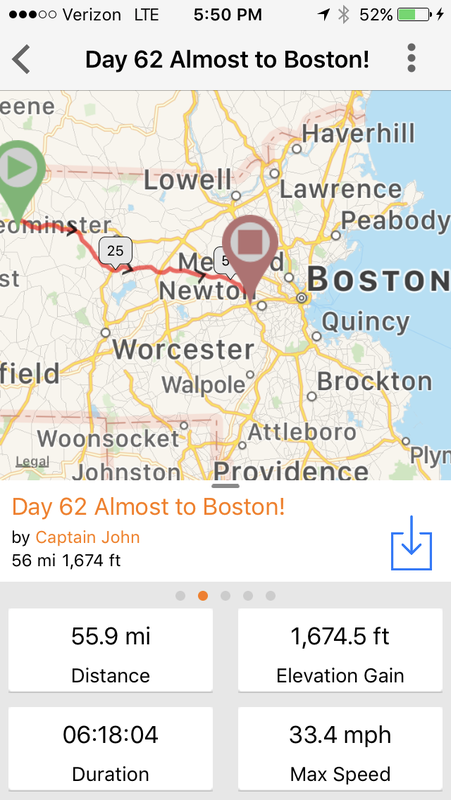 We’ve now pedaled almost 3,500 miles since departing Seattle on June 24th and we’re spending our final night in the Rig at the Minuteman Campround west of Boston. Tomorrow is Olivia’s birthday and the final day isn’t coming soon enough. The mental exhaustion has been immense, particularly as we navigated the winding congested roads coming into the Boston suburbs today. 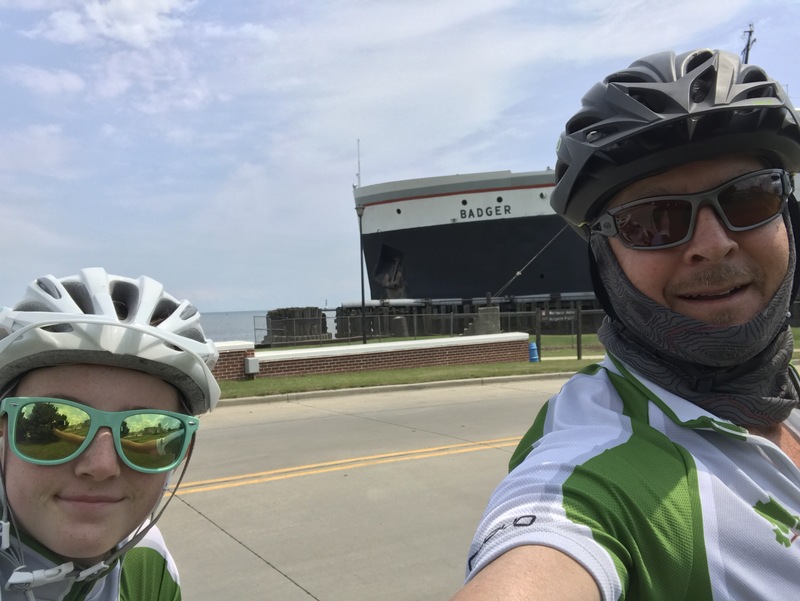 Yesterday, as we pedaled from Vermont, into New Hampshire, and finally Massachusetts we climbed 4,400′ on our 68-mile ride, second in vertical only to Going To The Sun in Glacier National Park! Yeah, we’re exhausted and our butts are sore. Tomorrow we ride down the Charles River into downtown Boston. 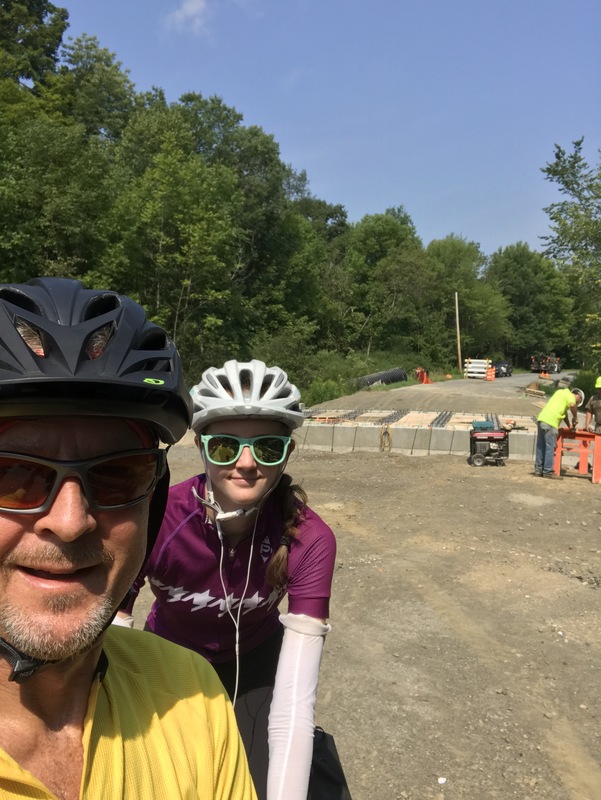 Olivia is excited to visit Make Way For Ducklings before we ride the final segment south to Marshfield where we’ll dip the front wheel of the tandem in the Atlantic at Green Harbor. A huge party is planned, and we couldn’t be more excited. Thank you to everyone who has supported us on this journey, through tweets and words and encouragement, and donations to @orcanetwork. 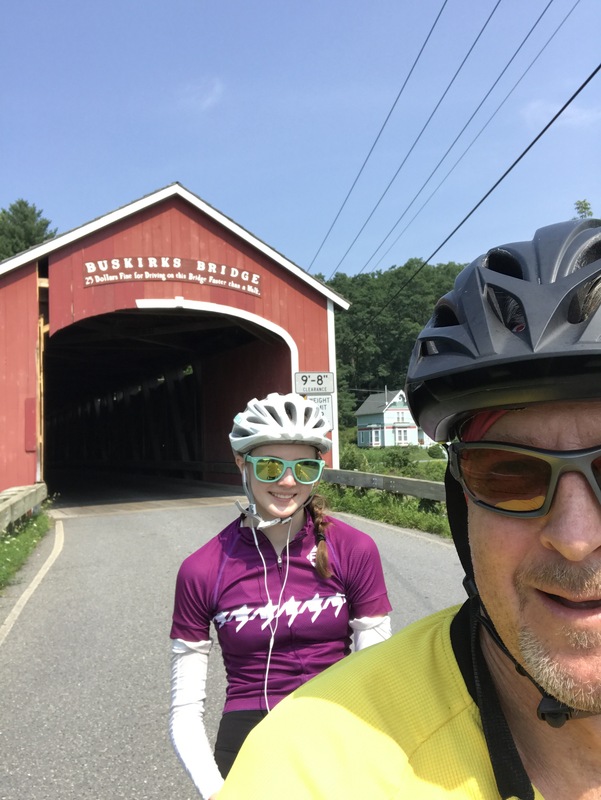 We rode over our first covered bridge just before entering Vermont. Today was one of the hottest days so far, with the temperature in the high 80’s and humidity in the 70’s. My jersey was drenched with sweat as we pedaled 53 miles through the rolling back country roads of NY and into Vermont. As we came upon the road closure sign I checked our map to learn the detour would be long so we proceeded past the sign in hopes of passing anyway. Fortunately the nice road workers offered to carry our bike over the half constructed bridge and we were soon on our way again. 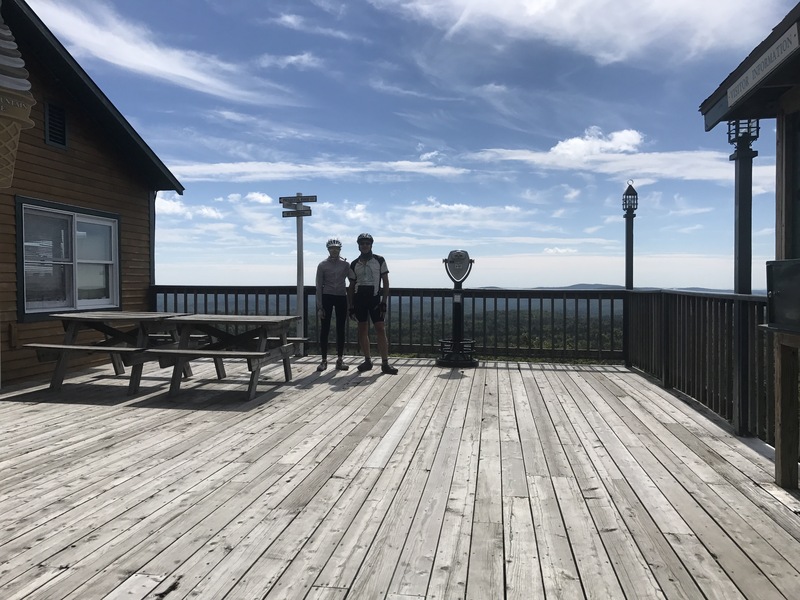 After passing through Bennington we started ascending to our final destination of the day, an RV resort at the Prospect Mountain Ski Area at 2,400 feet in the Catskills. It was reminiscent of Stevens Pass as we ground out the vertical, sweating profusely and savoring the last few drops of Gatorade and water in our bottles, muscles aching all the way. Fortunately the hot weather was short lived and we enjoyed a cool breeze through dinner. It’s now raining hard with lightening striking all around, though tomorrow is projected to be sunny and in the 70’s for our ride into New Hampshire. As I’m going through my usual morning routine of dressing, gathering gear, eating, and lathering with sunblock, my mood is overshadowed by my lack of sleep, swollen itchy eyes, and runny nose. I woke for the third morning in a row with my eyes crusted shut. 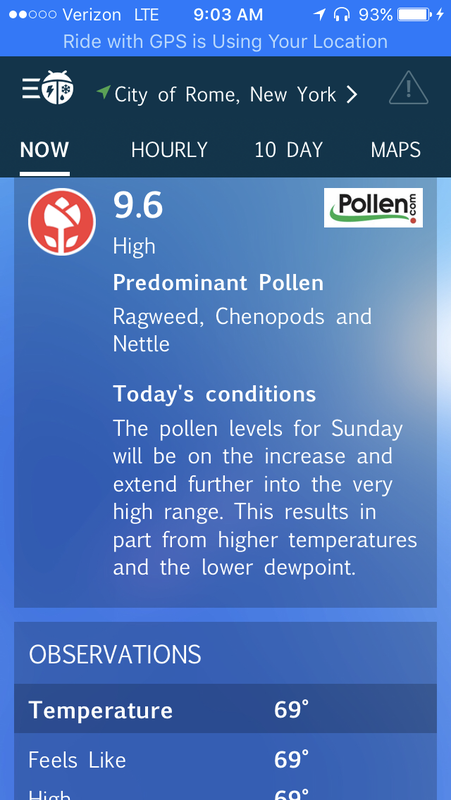 This turns out to be prime ragweed season here and I’m VERY allergic. 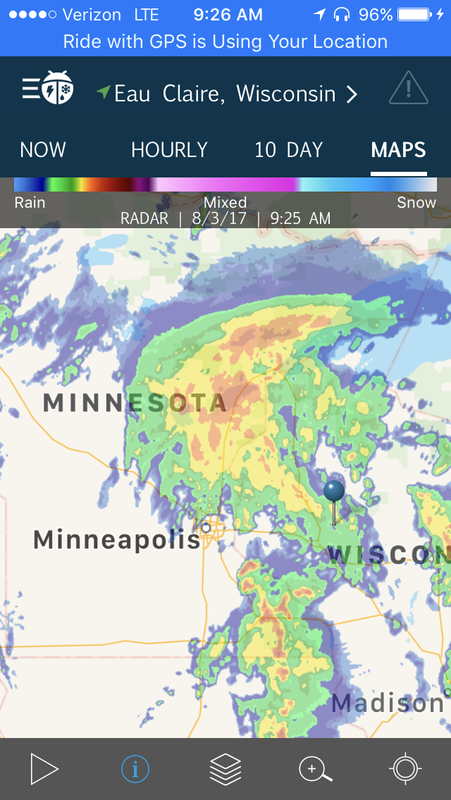 Having skirted through Minnesota without issue, I thought I was home free but apparently not. 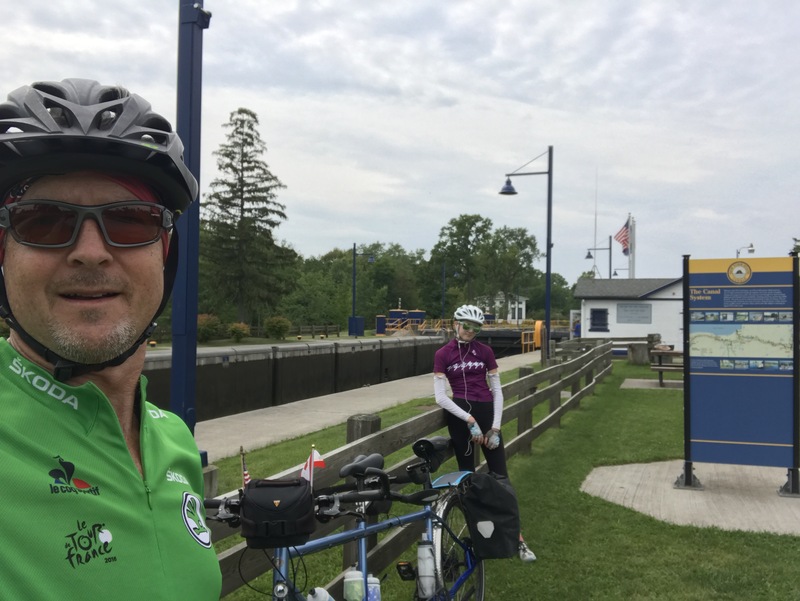 We’ve only got another 30 miles on the Erie Canal before we veer north to Saratoga Springs and Emily’s alma mater, Skidmore College. Tomorrow is a planned rest day so we’ll tour the campus, visit Emily’s favorite spots, and take in some horse racing at the local track. And of course watch the eclipse. Route planning and logistics has become exhausting. 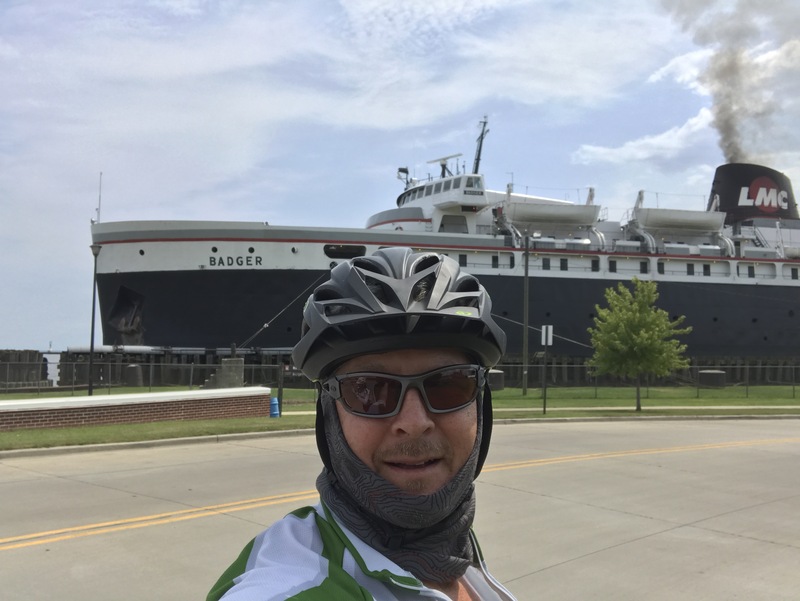 We’re off Adventure Cycling Association’s Norther Tier route now, so the process of using Google Maps and RideWithGPS is a tedious and time consuming compilation of bike blog notes, cycling tours and races, and just plain connecting of the dots with hopes for the best road conditions. Google Earth is helpful but more than once what appeared to be a concrete road turned out to be loose gravel. The Catskill “Mountains” will be our final physical challenge, though hardly a bother compared to the mental challenge this journey has become. We are ready to reach Boston and take a break! It’s not all bad though. 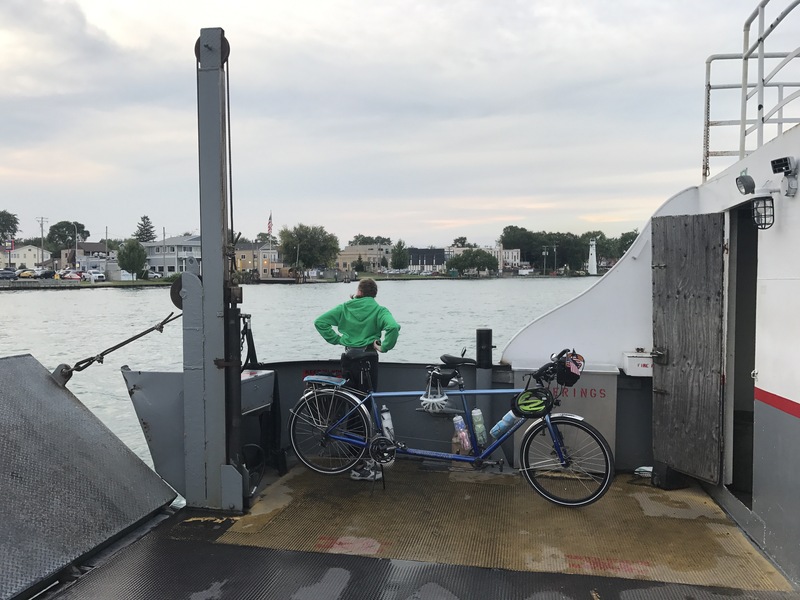 Our crossing into Ontario, CA on the small Blue Water ferry over the St. Clair river was fun. The ten minute crossing, costing only $4, dropped us in Sombra where friendly Canadian customs officials cheerfully scanned our Nexus cards and welcomed us in true Canadian spirit. Olivia was carrying the 12-pack of Molson Canadian I’d purchased at the tiny duty free store prior to boarding the ferry, which produced a snicker from the customs official. 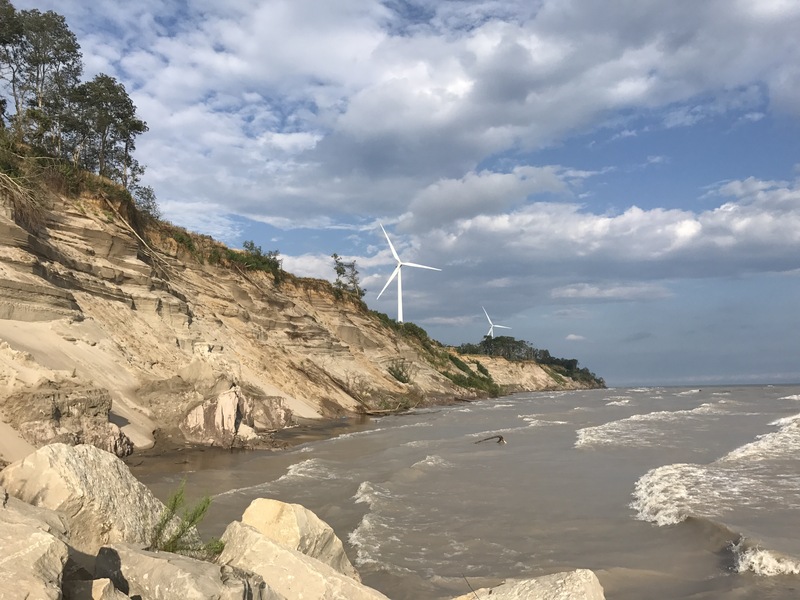 We spent the next few days riding the northern shore of Lake Erie, with winds predominately at our backs. 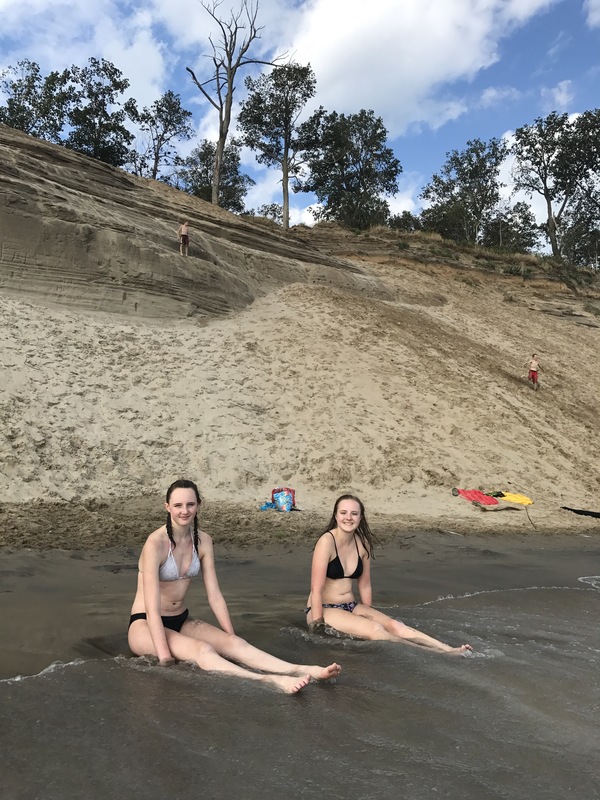 One night we stayed at a park with “Ontario’s largest sand pile” and swam in the lake, which was warm with big waves, and NOT salty. Very strange. As we continued our ride to the northeast we passed through quaint beach communities, reminiscent of Whidbey Island or Hood Canal. There were larger ports with boat harbors, touristy shops, and restaurants with good beer and local fish. We caught up to two bicyclists that turned out to be a mother and her 14 year old sun, riding cross country! Her husband is a teacher, driving their RV. 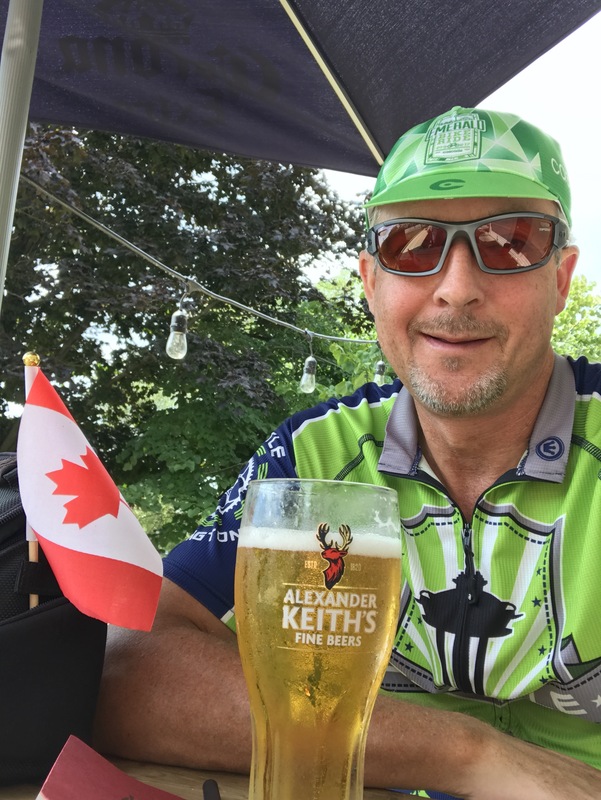 We hit it off and had dinner together that might, and rode with them again the next day to Niagara Falls. Niagara Falls was a good spot for a rest day. 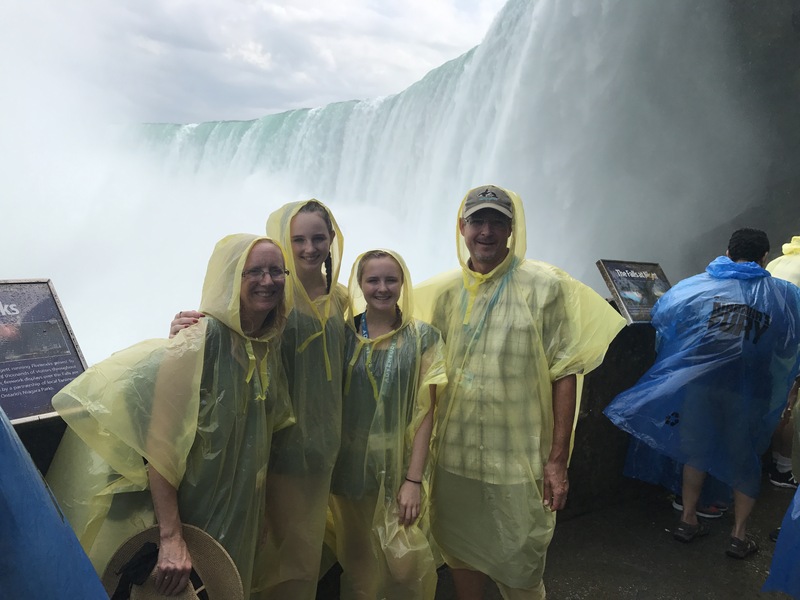 We did the boat tour, went behind the falls, saw the 4D movie, and played tourist. The Falls are pretty but it was very crowded and overly touristy. Tomorrow, we rest before our final four days of riding to Boston. We’re getting excited! If I’ve been remiss in writing, you can blame our coffee pot. Months ago when we were provisioning The Rig, we went to Cabela’s, the store known for its vast supplies of camping, hunting, and fishing gear. This was my first experience in a Cabela’s and I was not disappointed in the quantities though I later learned we had gone to the “small” outpost. Nevertheless, in my excitement to buy lots of stuff, I zeroed in a classic looking coffee pot which seemed just large enough for a few cups of coffee or could be used to just boil some water. The real selling point, however, was that it said “Cabela’s” on the exterior. Also, since it was the floor model, we could get a discount (bonus!). We were so exited to brew our first batch of coffee on our shakedown overnighter. John and I each enjoyed our first cup of some strong brew, but things broke down after that. Our second cup contained some grounds and by the time we tried for a third, partial cup, we were left with dark, gritty sludge. 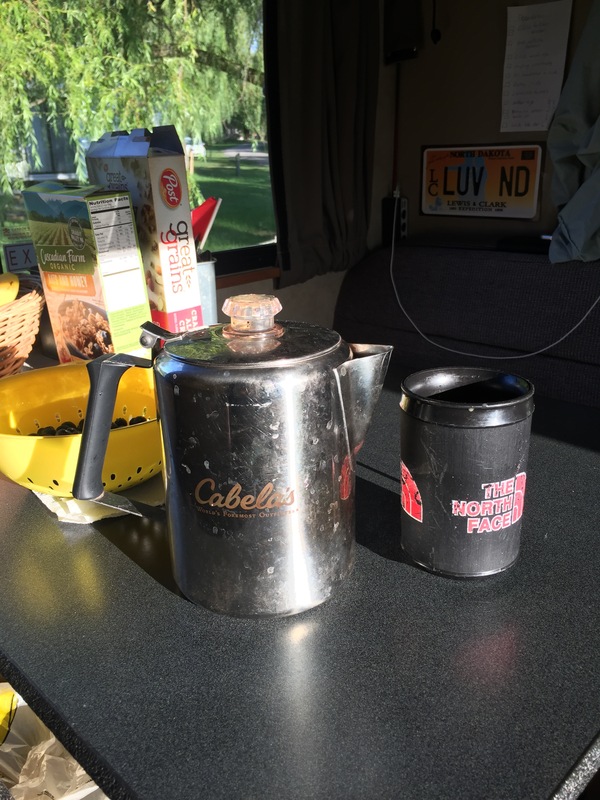 This coffee pot works like percolator where hot water boils up through a small tube and runs back down through the grounds. Apparently our Peet’s Major Dickason’s and anything Starbucks isn’t made for the the Cabela’s perk. We are too stubborn and loyal to try other brands such a Folgers which might have larger grounds, so we basically just suffer and complain. But, the real reason I hate our pot is the amount of time it takes to wash the dang thing. Equipped with a million parts, this one appliance creates the most mess and uses the most water. From my sailing past, it was ingrained in me not to use too much water when washing dishes, so even though we have full access to water, I’m still stingy on the water when washing. When I’ve had additional support on board, I swear silently as I dump messy grounds in the trash, but if I’m alone, I curse openly with words not fit for print with each piece I wash. Don’t tell John, but sometimes I just give it a rinse and call it good. 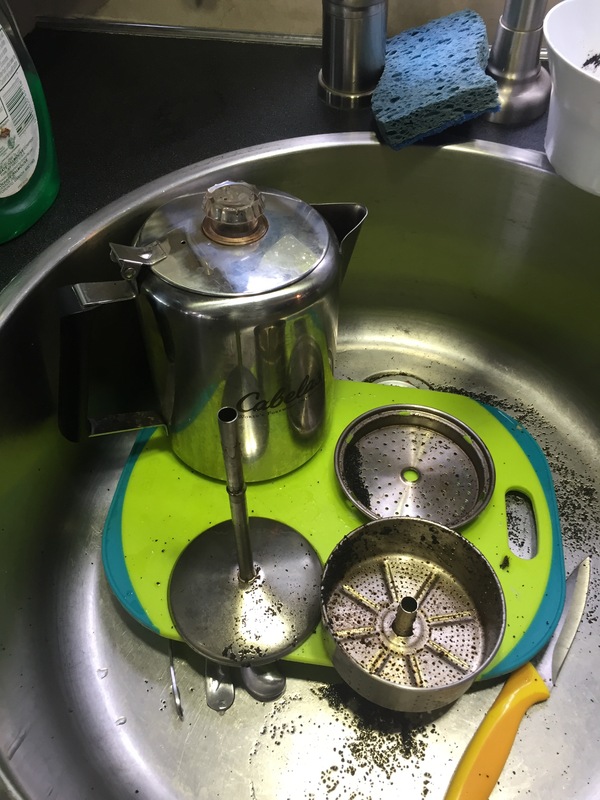 So, there you have it; I have not been writing about the small towns, forests, fields, and general sights because I’m too busy washing the damn coffee pot! 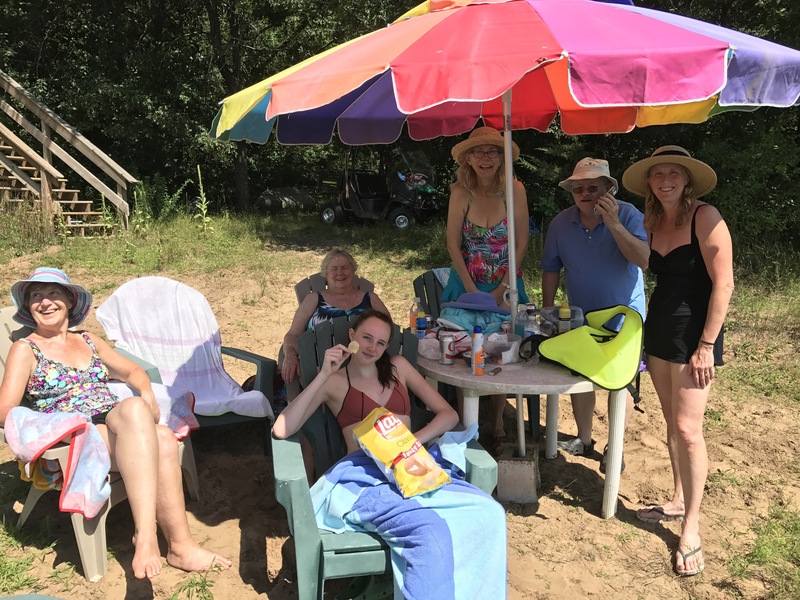 We had enjoyed a wonderful four day break at Bass Lake, a small family reunion of sorts with many aunts, uncles and cousins with significant others from as far away as Australia. 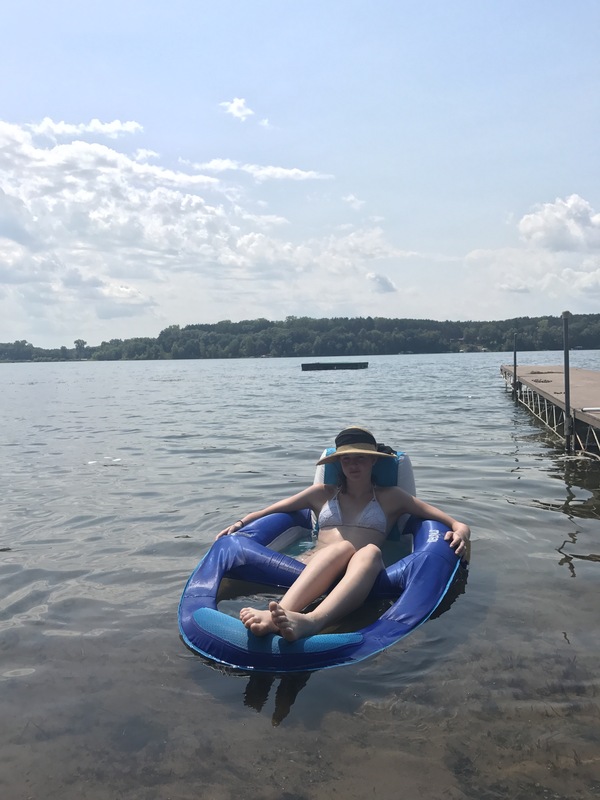 The weather was perfect for swimming and water skiing, with temps in the low 80’s. 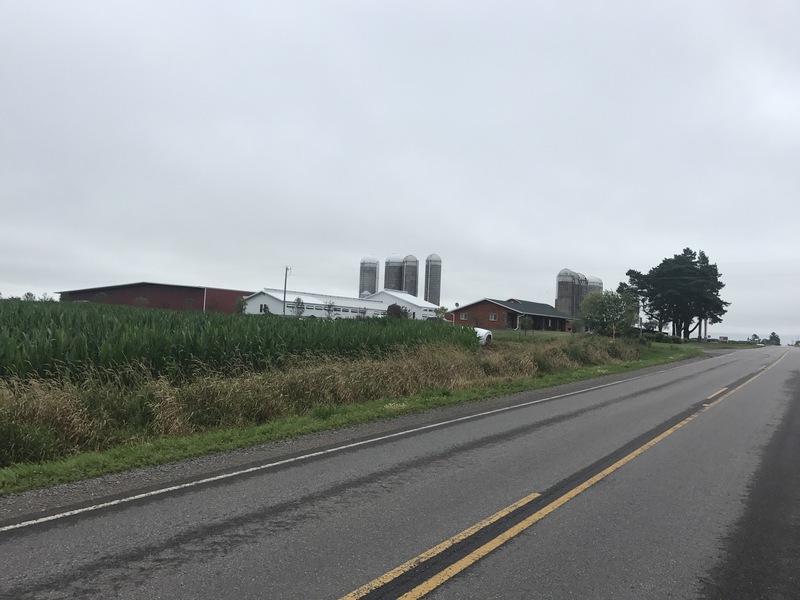 On Wednesday we departed Bass Lake to start day 40, passing numerous Wisconsin dairy farms with happy looking cows. 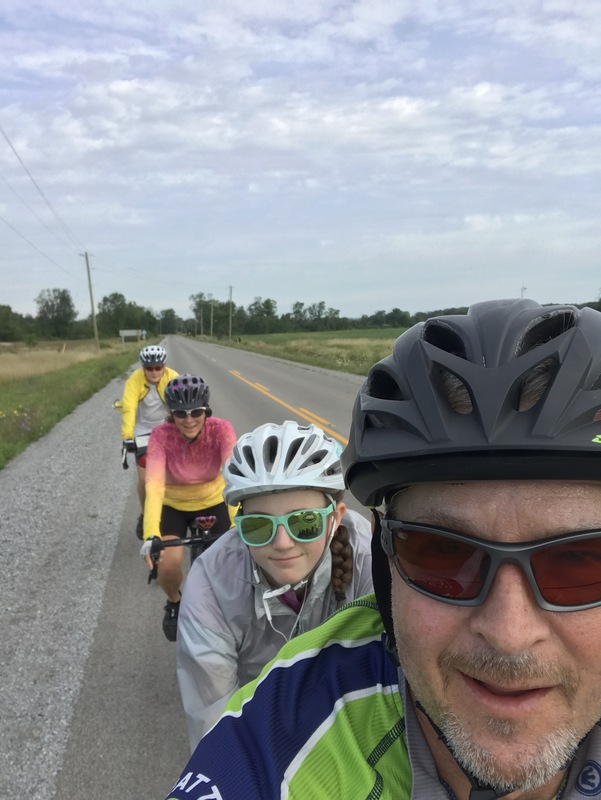 The headwind was not welcome, our muscles groaning as they realized the journey wasn’t over yet. As we mounted up this morning for what should have been a relatively easy, the radar showed imminent rain so we dug out the rain gear that had been stowed the entire trip. 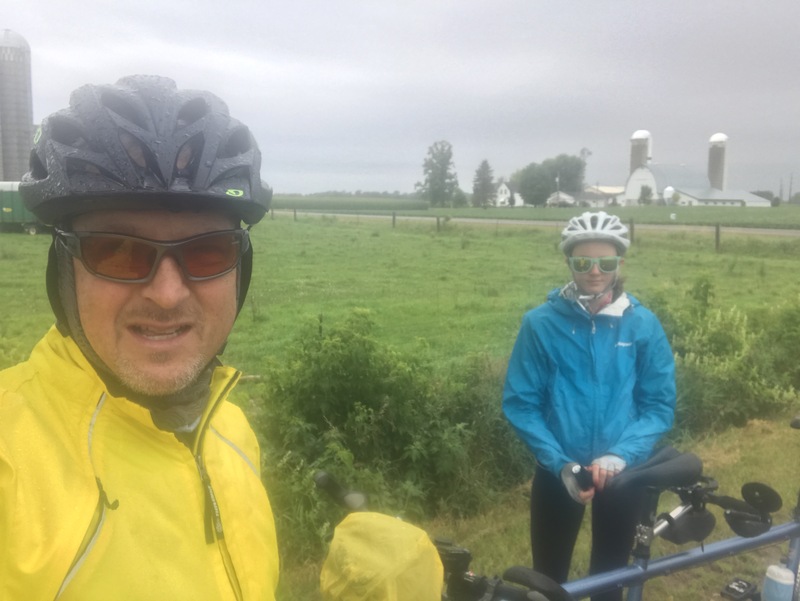 We were soon pedaling in a steady downpour, combined with 53 degree temperature and a stiff headwind. It was COLD! Before long we were soaked to the bone, and still 15 miles from a town big enough for a cafe. At one point we took brief refuge under a church porch but I convinced my Stoker we needed to push on. We finally made it to a diner and caught up with the Rig to dry off and change. The rain subsided in the afternoon so we continued another 25 miles, half on gravel roads due to a navigation error. Ugh! “Perseverance” was the word of the day. Tomorrow is another day! And Day 42 at that, 2/3 of the way through. Hoping for sun!